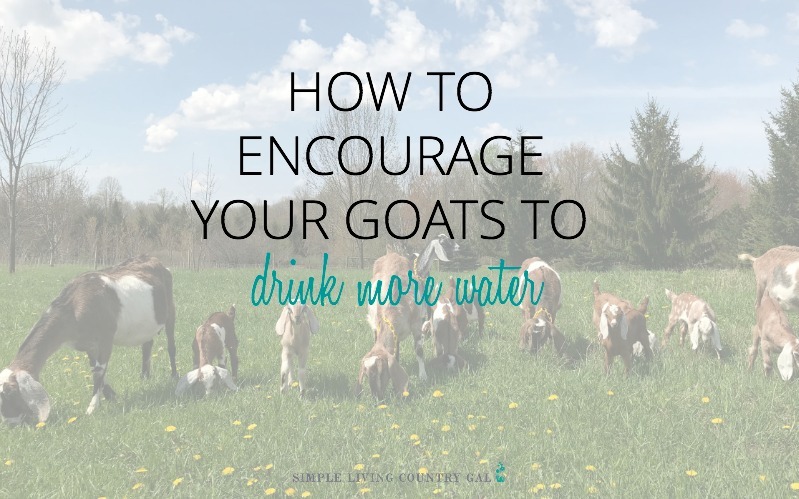 This post will give you tips on how to encourage your goats to drink more water. When an animal owner asks me for advice on how to help their sick animal I always ask about their water. More often than not their animal’s water source is not a “fresh all the time system”, not even I have that luxury and understandably most folks think that if the bucket has water in it, they are doing their part. Unfortunately, this is not the case, especially with goats. Goats are such a finicky animal. Contrary to all the old wives’ tales about how goats will eat anything even a tin can. They eat what they like and skip what they don’t. The same is true with their water. If it’s dirty or stagnant they will not drink it unless in dire need. Unfortunately, by that point you are probably already dealing with an ill animal. Why do goats need fresh water? Well, I believe as, with people, water is the magic ingredient to a healthy lifestyle. Drink that over other options and you will be healthier and ward off illness. The same is true with our goats. Water flushes out toxins and helps to keep their systems running smoothly. If you are milking your goats, water will keep that milk supply strong. 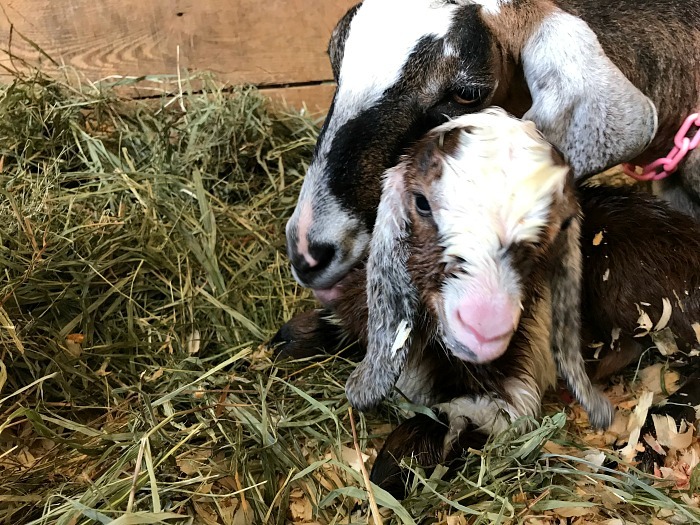 If you have pregnant goats, water will help not only the mother stay healthy so she can handle the stress of delivery but the kids she is carrying so they are strong and sturdy when born. Dehydration is a common cause of many goat ailments and of course, water is the key to keeping animals hydrated. How do we encourage our goats to drink more water? Our goal is to ensure our animals are always healthy and by doing a few things we can make sure that is the case. Now, that doesn’t mean they will never get sick. There is just no way to prevent all the things. It does mean that you will be eliminating the unnecessary which I think is our goal as animal owners. Just like with our families, by encouraging healthy habits they are sick less often, it is also true with any animal on our homestead. The number one most important thing you can do to make sure your goats or any animal for that matter is able to fend off illness is to always provide FRESH water. Notice I said FRESH water. Don’t just think that if the water bowl is full it is fine. Remember above I said goats are finicky. This is especially true when it comes to their water. Other animals will drink it dirty or not. Chickens, ducks, even pigs could really care less if their water is a little muddy. Goats….it’s just not going to happen. Dirty or stagnant water will get ignored rather than drank and our goal is to make sure our animals are drinking all the time. Every single day you will want to dump it and fill it. 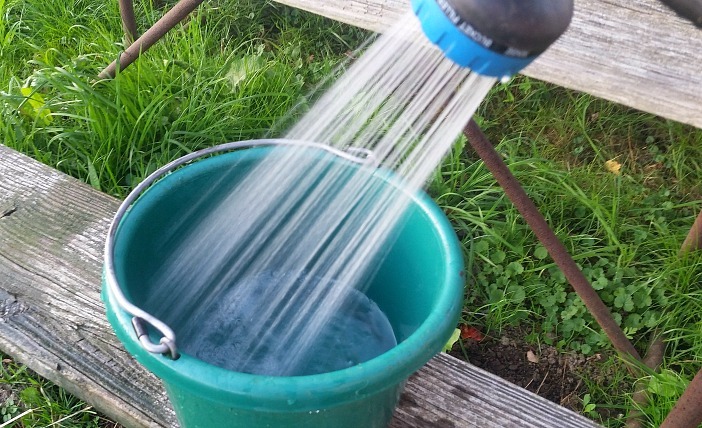 Even if the bucket is full, dump it out and fill it up with fresh water at least once a day. On our farm, we do this three times every day. For us and the area we live in, by consistently offering fresh water at all times our goats drink much more. And my goal is to get them to drink-drink-drink. Listen, the last thing we want on a hot summer day is warm water. 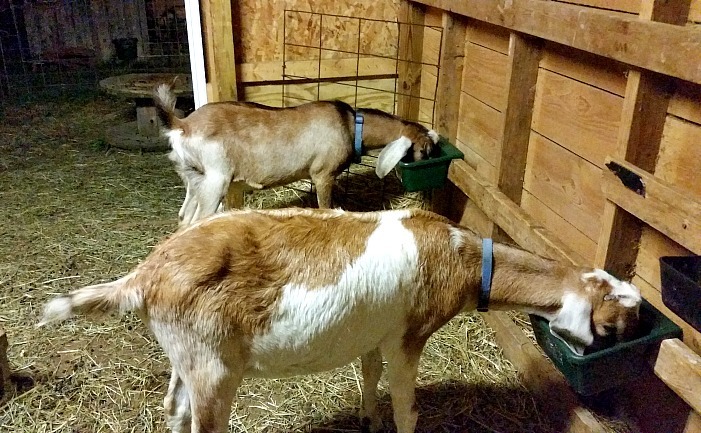 By giving your goats a cool fresh bucket you will find them drinking more often. The same is true in the winter. A nice warm bucket of water will usually get drank as you are pouring it! 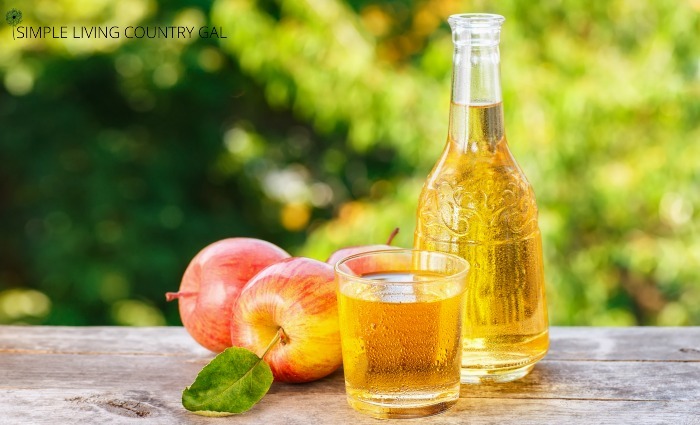 Goats love apple cider vinegar and just by adding a touch to their water you will find that bucket empty more often. I suggest adding 1 tablespoon per 1 gallon of water and offering this twice a month. Yes, just that little bit will be enough to get the water bucket emptied. Tip: If they ignore it at first don’t worry. Like I said goats are finicky and it might take them a time or two before they try it and see they love it. Offer the water and if they refuse it simply dump it out. Try it again in a week or two with a fresh batch of water and ACV. If you have a goat that is not drinking enough water or is sluggish or anemic you might want to add a little something they love to get them to drink fast. Most goats love molasses and will drink their water down when any is added. Also, the molasses gives a nice sugar boost that will encourage eating as well. 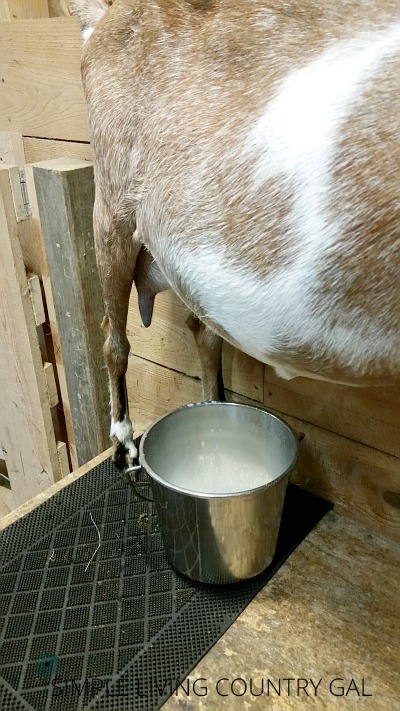 Another thing you want your goats to do if they are milking, kidding, or breeding. Just pour a bit into a bucket of fresh water and mix it up with your hand. If your goat is not used to molasses I would start with a small amount. Let your goat lick your fingers to taste and lead them to the water bowl. Once your goats become accustomed to the molasses they will usually come running when they see the jar in your hand! The molasses can help in dire situations so it is a nice trick to have in your natural goat care arsenal. I like to have one water source per 2 goats. So, if I have 6 goats in an area I will have 3 buckets of water. I also like to spread them out so there is no reason to fight for a drink. Two buckets inside the barn with an outside option works best for our set up. Just like with adult goats, goat kids need that water as well. Sure, they get enough hydration while nursing or when they are bottle fed, but the quicker you introduce water the better. Keep a bowl down low for the kids so they can check it out. Just a little water is all you need. Goats are a naturally curious animal and will stick their heads inside to see what it holds. Make sure to especially change this water out frequently to ensure it is not soiled. Each week you will want to wash out your water bowls to make sure they are clean. On our farm, we like to do this chore on Saturdays. Hubs will dump and collect the bowls and bring them to me where I will wash, rinse, and fill them at our outside water station. He will then take them back where he is usually greeted with a curious crew. Just by cleaning out those water buckets we find that our goats drink down a full dish right then. Something Hubs and I love to see. To wash out your water bowls use a water/bleach spray and scrub it all down both inside and out. Rinse well and fill with cool clean water. When raising any type of animal promoting health is always better than waiting for illness to happen then treat. If water is a major game player in a healthy animal why wouldn’t we take the time to make sure it is fresh and available. Changing out water is so simple and yet one of the most effective ways to ensure our animals all healthy all year long. Do you have a tip on how to encourage your goats to drink more water? Leave a comment below, I would love to hear from you!